San Francisco, CA – With the release of her seventh full-length album and a brand new endorsement deal with Two Old Hippies, who worked with Breedlove Guitars to build her a new custom-made guitar, Katie Garibaldi has proven herself to be an artist with undeniable talent and lasting appeal. Based in the golden city of San Francisco, this determined and enthusiastic singer/songwriter/guitarist is an avid national touring performer who has amassed a devoted fan base, due in large part to her engaging live shows and a personal connection to her listeners through her music. Katie sings with an emotional resonance that, combined with her catchy melodic songs and her soulfully expressive vocals, captures her audience wherever she performs. While she’s been compared to household names such as Sheryl Crow, Jewel, and Taylor Swift, Katie has a charismatic musical style all her own wherein her equally pop- and country-tinged folk-rock gives her a distinct and edgy sound—Americana with sparkling and memorable melodies. This new album, Follow Your Heart, was recorded at John Vanderslice’s Tiny Telephone Recording Studios in San Francisco, CA, and engineered by Ian Pellicci. The band includes Katie Garibaldi on vocals and acoustic guitar (as well as writer and producer of the entire album), Memphis-based Kevin Blair on electric and upright acoustic bass, and Bay Area local Todd Richardson on drums and percussion. Magik*Magik Orchestra also makes an appearance on the album, which features Michelle Kwon (The Delphi Trio) on cello and Philip Brezina (Brothers Comatose) on violin. Katie was fortunate to have the opportunity to co-write and arrange the string sections with Magik*Magik Orchestra artistic director, Minna Choi. Other notable players include Max Butler (pedal steel, mandolin, and ukulele), Sylvain Carton (flute, clarinets, and saxophones), Henry Hung (trumpet, trombone), Matt Blackett (electric guitar), and Shawn Shaffer (harmonica). Follow Your Heart contains 13 new tracks, which include her most personal recorded songs to date, all of which hearken back to her simple yet powerful message about the importance of having the conviction to follow your heart. 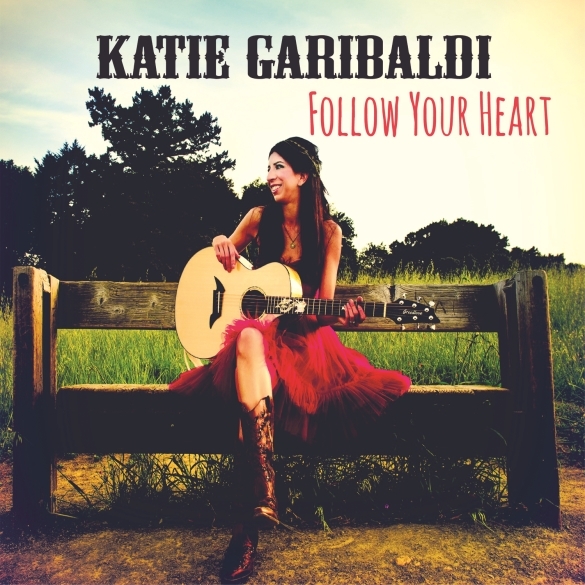 Follow Your Heart is Katie’s first full-length release of all new compositions since her award winning Next Ride Out album in 2009. In that time, the Americana songstress has toured the country and accomplished many exciting achievements, including being named a Music Connection Magazine Top 100 Live Unsigned Artist and being featured on the cover of The Indie Bible four different times. Most notably, Katie received the Songwriter of the Year award in 2012 from Songsalive!, the largest international non-profit membership organization and social community for songwriters and composers.